I know many of you are on a New Year's Resolution diet. Sometimes, you just need a little sweet something to tie you over. 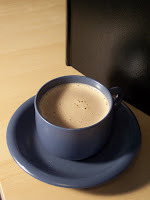 One sweet treat I would make when I was a phase 2 "south beacher" was a cup of homemade hot cocoa with sweetener. It gave me a chocolate fix but kept me on track. When you get a chocolate craving, give this a try! It's quick, yummy and guiltless.